Astronauts arrive on Mars to find everything is really red and the locals are really ANGRY! 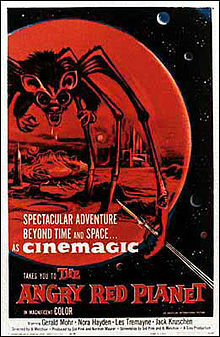 They encounter a man-eating planet, a rat-bat-spider-crab monster, a giant amphibious amoeba and a three-eyed Martian who tells them to go away and never come back. Lovable low budget nonsense with expedition leader Mohr sleazing all over Hayden who wears perfect 50’s make-up that never smudges once. NB: although scientific advances have reduced food to capsule form, the team still collates their findings on a clipboard. There’s lots of stock footage to cherish as well.